"Girls In Bikinis, Boys Doin' The Twist" / "Tick, Tick, Tick, Boom!" As Gilmore Girls season four heads to its climactic close, various plot devices need to be put into place. Rory and Dean need to move closer together. Lorelai and Jason, Luke and Nicole, further apart. Spring break seems like an odd way to make sure this happen, especially with unlikely participants like Rory and Paris. I know California is where Gilmore Girls was filmed, so those beaches were probably close by, but Paris and Rory still seem like complete fish out of water in an odd episode. 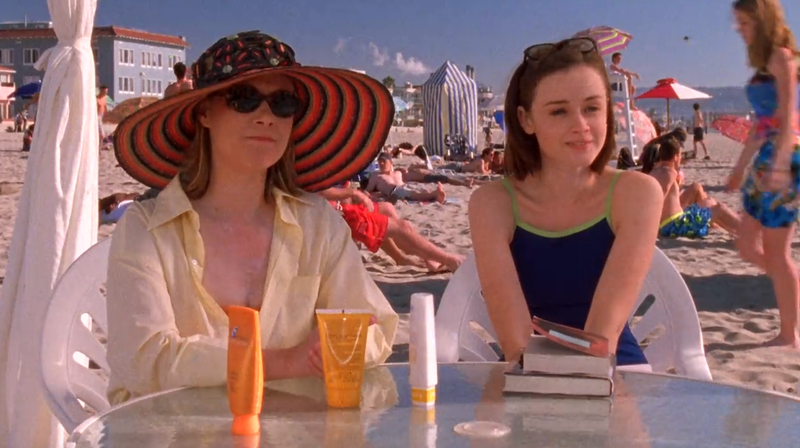 Let’s put aside how random it would be for Madeline and Louise to run into Paris and Rory on the beach at spring break in favor of how delightful it is to see them again. There’s also no other way that Rory is going to have a drink (let alone get kissed by Paris), leading to the drunken ex phone call, which is like a siren call to exes all over the globe (although texts and posts now, probably). Also in the “making little sense” department: Why would Nicole work so hard to get back together with Luke just to cheat on him? It’s impossible to tell if this is out of character for Nicole; we know so little about her, except for her status as a relationship roadblock for Luke and Lorelai. Luke seems more invested than we could have imagined, but apparently he needed a big break like that to get to the self-improvement breakthrough he’ll reach in two episodes. With all these relationship anvils flying around, thank goodness we have some classic Stars Hollow whimsey to temper everything. Kirk continues to be an unsung hero of season four, getting the better of the girls in his pedi-cab, and becoming the focus of his own tale with the lost Easter egg saga. Taylor’s toupee on its own could be an entire subplot, but the added operation to find all the rotting, smelly eggs is Stars Hollow gold. The greatest part, of course, is Luke saving Kirk from permanent Taylor banishment by finding all of the eggs himself. The Luke-Kirk friendship is an essential part of Gilmore Girls, but may actually reach its apex with this episode. Second in cute Stars Hollow friendships: Jackson and Gypsy making lots of fun of Taylor’s fake hair. “Toupee guy says what?” He’s so mean to Kirk this episode, I wish they’d piled it on even more. Not saying that Rory is wrong about Princess Lindsay, demanding that Dean work double-shifts while she stays home and learns how to cook in 2004. But considering this is someone who is now married to someone else, Rory shouldn’t have a whole lot to say in the matter, even if she’s worried about her old friend’s future. Also, the attraction factor between Rory and Dean is still going to be strong, so you can’t really blame Lindsey for being worried. And then, everything explodes. You also have to kind of admire Digger’s dad Floyd for setting everything up in such spectacular fashion, with the announcement that he’s taking revenge on his son for leaving his firm by suing his new company right in the middle of a dinner party. Love how easily the wife was in on it too, grabbing her purse before running out the door. It was sad to see Lorelai and Emily estranged again after almost getting so close, but this is all on Lorelai: She should have told her parents months ago. When Richard and Lloyd end the episode by teaming up against Digger, it’s a little shocking, but not wholly unsurprising: Richard is likely more upset about Digger lying to him about his daughter than almost anything else. Honestly, every time I look at Lorelai’s hair at this point, I just think about Farrah Fawcett-Majors. What do we think about Michel’s apparent crush on Lindsey? Man, remember when Howard Dean was about as weird as a presidential hopeful could get? Special spring break guest appearance by: The Shins! This week in Gilmore entitlement: It’s really Gellar entitlement, but sure, if you have a stack of twenty dollar bills to throw around, you can expect excellent treatment at your seaside motel. Also, thinking it’s cool to bite your boyfriend, and not even being sorry. Next week: The most famous trio of Gilmore Girls episodes kicks off.